Enclosing a wooden hot tub or Japanese Ofuro by surrounding it within a deck provides the benefits of easier access into the hot tub as well as hides the plumbing pipes that are found on the outside. 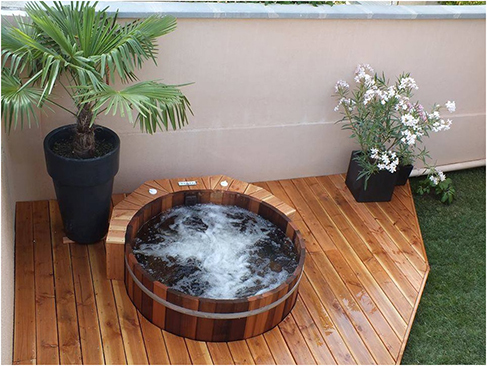 It also is a beautiful architectural design to see a wooden hot tub sunken into a deck and fully enclosed on all ends. 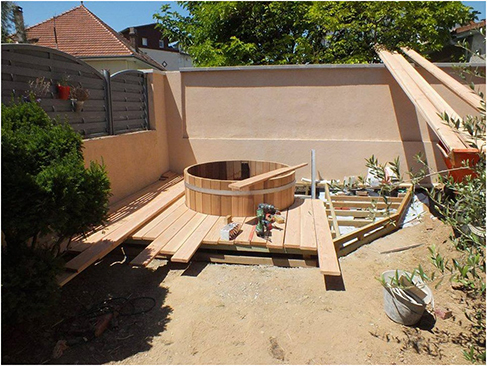 The first step when building an enclosure for a wood hot tub is to determine the height that you want the decking enclosure to be relative to the height of the hot tub. Generally you will want it to be within or less than a step distance. 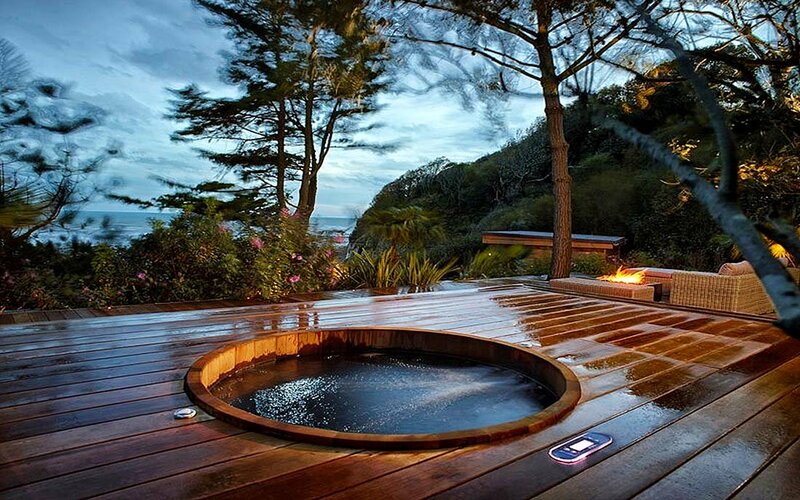 If the top to the hot tub is too high then you would need to add a step to help get into the hot tub. 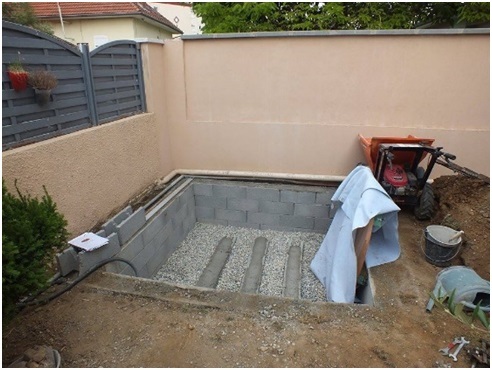 On many occasions instead of adding a stair the customer will choose to sink the tub below the ground so that it lines up with the top of the enclosure. 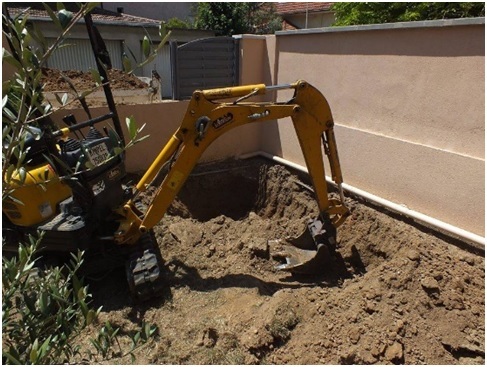 If you are sinking a tub below ground you must build a proper retaining wall so that the earth is separated from the tub and will not collapse. Also consider that this “pit” needs to drain. Rain water and over spillage would fill the pit quickly without proper drainage. Finally don’t forget that the pit needs to have proper base as well an extra spot to place the mechanics of the tub on. Once you have determined the height of the tub you can then begin to enclose the tub. This can be done with many types of building materials such as cedar or other types of wood. However composite decking also works well as an optional enclosure material. Even building stones can be used to enclose the tub. It is important when building an enclosure for a cedar hot tub to consider access to the mechanical equipment. Northern Lights cedar tubs offers many hot tub heating options and so once the customer has chosen the heater you then need to locate the mechanics relative to the hot tub and the power source (electricity, gas, wood). Regular maintenance is needed such as removing and cleaning the filter. So it is important to be sure your enclosure has easy access to the mechanics. If you choose to locate the mechanics outside of the enclosure then consider that the longer the piping distance away from the tub, the more pumping power is needed. An upgrade to an extended piping kit will be needed to help overcome this added piping head pressure. Northern Lights offers extended piping upgrades for up to 25 feet away from the tub, call us to discuss. Once your enclosure is properly framed according local building codes you can then complete it by providing a matching stain or water protective coating. Because the enclosure has horizontal surfaces, it is important to properly prepare the surface from frequent water and sunlight that may be present. Often customers choose to match the color of the enclosure to the cedar color of the cedar hot tub, but you can also provide a unique design going completely opposite.